This will be an amazing symposium with speakers ranging from our very own grad students to professors and work professionals. The schedule and topics are attached in the poster. I highly encourage everyone to attend this event sharp on time. 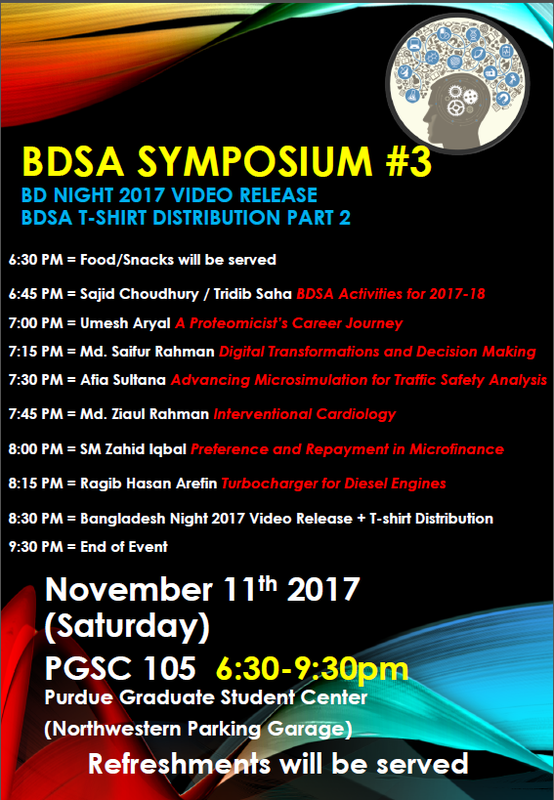 We will also release the official Bangladesh night Video and distribute BDSA T-shirts (if you did not collect it during Winterization community service earlier that day) sharply after the talks are done. Food/snacks will be served in the beginning of the event so that we can munch on them while listening to the talks and not interfere while the presentations are being done. So I request everyone to be at the location by 630pm. If you are late for any reason, don't worry, just silently enter the room and take a seat and wait until the current talk is over to grab food.